Improved roads in the 18th century and the development of railways in the 19th opened up the more wild and remote parts of the British Isles to travellers. Early tourists left evidence of their appreciation of such scenery, first through sketches and drawings, and later through photographs. Publishers met the growing taste for literature about scenic places and historic sites. 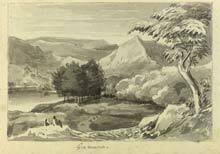 A sketch of Grasmere was one of several Lake District scenes captured by John Eagles in 1812. The mountainous and rugged country of the Lake District was popularised by the Romantic poets Wordsworth and Coleridge. It inspired artists and writers and encouraged individuals and parties to tour the area. Derbyshire was also admired for the beauty of its landscape. Pictorial guides such as 'Peak Scenery' catered for the burgeoning tourist interest. 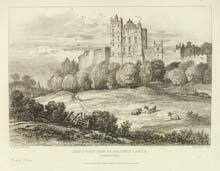 This romantic view of Bolsover Castle by F.L. Chantrey shows the 17th century house built for the Cavendish family. The Nottinghamshire geologist Arthur T. Metcalfe made a tour of Argyll in Scotland around 1904. His trip was primarily a scientific expedition, but he took the opportunity to enjoy the scenery. His album of photographs is mainly concerned with his geological observations, but includes typical tourist shots of the steamers, the piers, towns and villages. 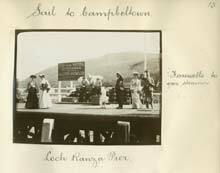 Here we see his travelling companions on Loch Ranza pier, Arran. Further sources relating to this subject area are held by Manuscripts and Special Collections at King's Meadow Campus. See our website for information about our collections and catalogues.